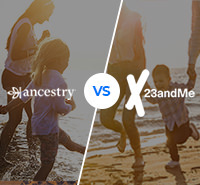 AncestryDNA vs. Family Tree DNA: Which DNA Test Kit is Better? What started as a trend has become a full-on phenomenon. Millions of customers have ordered home DNA testing kits in recent years, swabbing their cheeks and spitting in test tubes to answer that age old question: Who am I? These tests can offer incredible insights about our genetic and ethnic make-up and the twists and turns our ancestors took over the eons that led us to where we are today. And even better, the tests are affordable and couldn’t be easier to take. 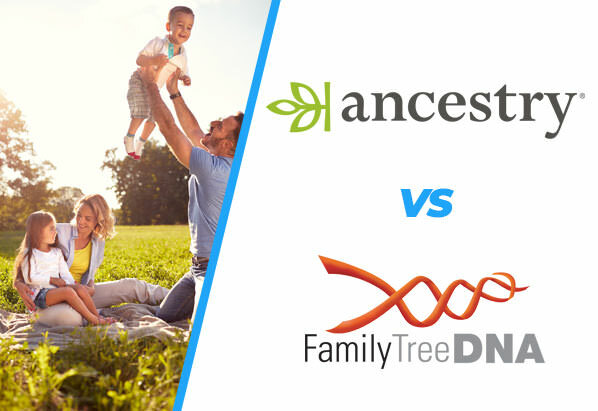 AncestryDNA​ and Family Tree DNA are standard bearers in the industry, but how do they match up head-to-head? Let’s start with a look at both companies and what they have to offer. Shipping: $9.95 for the first kit, $4.95 for each additional kit. $24.95 for expedited shipping on first kit, $12.95 for each additional kit. With more than 6 million users, Ancestry.com is one of the most popular and useful genealogy tools anywhere. The popularity of Ancestry.com has helped the company build up an enormous database with more than 6 million users and over 17 billion searchable records. AncestryDNA harnesses these resources to create one of the most affordable and reliable DNA testing kits on the market. The tests can help you learn about your DNA makeup and ethnicity, as well as the “genetic communities” and ethnic regions your family roots run through. “Family finder” test ranges from $79 to $546 (depending on how many markers you want). The $79 family finder test is autosomal and includes family finder matches and ethnic percentages. The company also offers father’s line tests ranging from $169-$359 and mother’s line tests ranging from $89-$199. Founded in 2000, Family Tree DNA has been providing customers with some of the most extensive ancestry mapping tests anywhere for nearly 2 decades. Today it provides a more comprehensive overlook of your family roots than virtually any other service. While other companies stop at simple autosomal tests, Family Tree DNA can perform 67 marker Y-DNA tests, your mitochondrial sequence, and your matrilineal or patrilineal lines. The results of these tests can trace your family’s path back hundreds of thousands of years, and can even tell you if you have neanderthal DNA - and how much. Before we put these 2 industry leaders against one another, let's break down what some of these DNA testing terms mean. DNA - Deoxyribonucleic Acid - is the unique genetic code that makes each and every one of us who we are. After you've submitted a saliva sample or a cheek swab, technicians can isolate your DNA and use their findings to map out your family tree and the twists and turns your ancestors took eons before you. Autosomal. These are the most popular and basic DNA tests. Autosomal tests check 22 out of 23 pairs of chromosomes from both men and women. These tests can only really give you clear answers going back about 3 or 4 generations. Y Chromosome test (Y-DNA). These tests check your patrilineal ancestry by checking the DNA found in the Y-chromosome. These tests can trace your ancestry back quite far, but can only be performed on men. Mitochondrial DNA. These tests check mitochondrial strands, which come from your mother's line. These tests can trace your mother’s side of the family back dozens of generations, and can be the basis for some insight into the region, ethnicity or family group you descend from. DNA tests can also vary in terms of the number of markers they check. Markers refers to the specific, unique DNA code sequences we have. The idea being that the more markers are checked, the more precise the test will be. So how do AncestryDNA and Family Tree DNA compare? Let’s break it down. AncestryDNA keeps it simple with a $69 autosomal DNA test. With these plans you will have to pay shipping - at $9.95 for the first kit, and then $4.95 for each additional kit. If you’d like to get the package quicker, you can pay $24.95 for expedited shipping on the first kit, and $12.95 for each additional kit. The $4.95 shipping price on each additional kit is a great deal because it capitalizes on the fact that DNA kits have become a very popular gift in recent years, so if a couple is ordering 2 kits, they can save a little cash. AncestryDNA also sells access to their genealogy records - which include more than 17 billion searchable historical records. Access to the company’s US records costs $19.99 per month, and access to international records and US records is packaged together at $34.99. In other words, for just over $100 you can buy a DNA kit and a month of access to international and US records that you can use to dig up all types of information about your roots. With Family Tree DNA, the pricing gets a good bit more extensive. The basic “family finder” autosomal test costs $79, but things get pricier from there. A family finder test plus a 37 marker Y-chromosome test costs $248 and with 67 markers the price rises to $347. A family finder with full mitochondrial sequence costs $278, and with 67 markers the price goes up to $546. If you’re checking solely your patrilineal heritage, there are 3 test options ranging from $169 to $359, which test 37-111 markers. With matrilineal tests the prices range from $89 to $199. 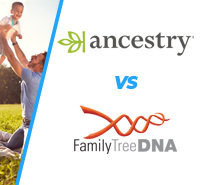 Family Tree DNA also gives you the option to transfer your results from other companies (including AncestryDNA) so they can be tested by Family Tree DNA and compared to other user results, possibly helping you find distant relatives. These transfers cost $19-$58 depending on the number of markers. Family Tree DNA offers more options, but these tend to be more than the average user is interested in, or may be willing to spend. AncestryDNA keeps it simple and adds discounts on shipping additional packages. Home DNA test kits are known for being easy to use. With AncestryDNA you place your order online and in a few days you will receive the test kit, which includes full instructions, a saliva collection tube, and a prepaid return mailer. You simply leave a saliva sample in the test tube and drop your package in the mail. Typically your results will arrive 6-8 weeks after the lab receives your kit. During times of high demand - such as the holiday season - it can take longer than 8 weeks. You can also register to view your results online somewhat sooner. After you place your order with Family Tree DNA, you will receive a package with either a snap-off or a push-down cotton swab. With the snap off you simply rub the scrape on the inside of your cheek for about a minute and then insert the swab end of the scraper into the vial that came with the test kit and snap it off so the swab end stays inside. Repeat this process for the second swab and place it in the sealed plastic bag with the signed release form in the included envelope. The process is the same for the scraper test. In both tests, you’ll want to wait an hour after eating or drinking. These tests can be easier for babies and the elderly, who can have trouble producing the saliva needed for the other tests. The results typically take 6 to 8 weeks from the time the lab receives your sample, though the family finder test only takes 4 to 6 weeks, the company says. Both tests are simple to take and can be performed very quickly. That said, Family Tree promises to get you the results somewhat quicker than AncestryDNA. AncestryDNA can give an assessment of your family tree origins based on more than 350 regions around the world, which the company says is 5 times what is offered on other DNA tests. These regions can be as broad as “North Africa” or “Europe East,” or as specific as the northeastern part of the Mexican state of Michoacan, or even specific towns in Ireland. Ancestry DNA “migration stories” can be used to create a picture of the paths your ancestors took over the centuries and your results, and those of millions of other users, can be analyzed to help you fill in the gaps in your family history. Through matching your results with other users, and through the use of the “new ancestor discoveries” feature, you can potentially find relatives you never even knew you have. The company's “shared ancestor hints” and “genetic communities” information can point out intriguing connections that you never thought your family had. In addition, because AncestryDNA has more users than any other service, there is simply a greater likelihood that you will find genetic matches in their database. Also, your test kit can be ordered along with access to Ancestry.com’s enormous historical records database, if you’re really looking to go deep into your genealogy. Family Tree DNA has been in the game for longer than anyone else and has the know-how and features to prove it. You can order a very extensive array of DNA tests with Family Tree, and you can be assigned a personal liaison to help you make sense of it all if need be. Family Tree DNA makes it easier than any other company to connect with matches online. The company can provide you with the names and emails of DNA matches, allowing you to connect one-on-one with people who could be your long-lost relatives. On the other hand, Family Tree DNA has a much smaller user database than competitors like AncestryDNA. With Family Tree DNA you can get comprehensive ethnicity results through the “myOrigins” visual mapping tool that can show the ethnic and geographic breakdown of your ancestors and matches your DNA to one of 18 regional and population clusters worldwide. The “ancient origins” actually compares your DNA to samples taken from archaeological digs to see what you share with our ancient ancestors from way back. You may find out that in addition to being say - a suburban small business owner - you’re also the descendant of metal age invaders or hunter-gatherers from the neolithic era. In addition, unlike AncestryDNA, Family Tree DNA allows you to upload your results from other DNA services for a fee of $19-$58, and the results can then be searched on the company database. Both companies supply extensive information about your ethnicity and your family’s migrations over time. And while we love the fact that Family Tree DNA can put you directly in touch by email with your genetic matches, AncestryDNA simply supplies more data in terms of specific geographic regions, genetic communities, and migration history, and has a far larger user database. Family Tree DNA gives you many more testing options - including bundled mitochondrial tests with 67 markers - but the majority of users will probably just opt for the basic autosomal test offered by both companies, so this difference isn’t enough to tip the scales for Family Tree DNA. Family Tree DNA has an extensive online knowledge base and frequently asked questions sections that can walk you through taking the tests, getting your results, and how to read them. You can also access scientific papers and recommended reading online, which should help you gain further insight. In addition, you can join online forums run by the company, and contact customer service by way of an online form, and a phone line based out of Houston, which is answered from 9am to 4:30 Central Time, Monday through Thursday, and until noon on Fridays. AncestryDNA also has an easy to navigate online knowledge base and FAQ sections which are both quite extensive. The company relies heavily on these answers to suffice, because otherwise your only option is to call them by a toll free number that is answered from 9am to 11pm Eastern Time, 7 days a week. Both companies provide very extensive information that you can easily access online. And while the Family Tree DNA phone number isn’t toll free, the company also provides an online form you can easily use. We also found that the selection of informative resources available was more extensive. Family Tree DNA has more experience than any other company in the DNA kit industry, and AncestryDNA has more features and a bigger database than just about anybody. Both companies are great options if you’re looking to gain some solid, fascinating insight into where you come from. We gave the edge to AncestryDNA though, due to the larger database, more extensive features, and simpler pricing structure. The Top10 DNA Testing staff is comprised of professionals with a vast knowledge across the world of DNA and genealogical services. Members of our international team have extensive first-hand online experience in helping people build their family trees, and copywriting and editing for various online and print publications. 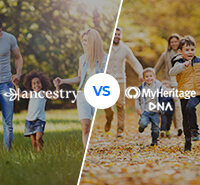 AncestryDNA vs. MyHeritageDNA - Which DNA Test is Better for You? 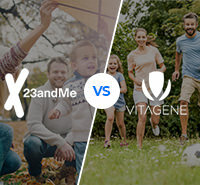 23andMe vs. Vitagene: Which DNA Test Kit is Better?